What that week showed me is that for Berlin history, there is only one game in town: the Wall. Pieces of the Wall are everywhere, and so is historical interpretation of the Wall—not just along its former route, but at Alexanderplatz near my hotel, and woven throughout the tour I took of the city’s modern architecture. 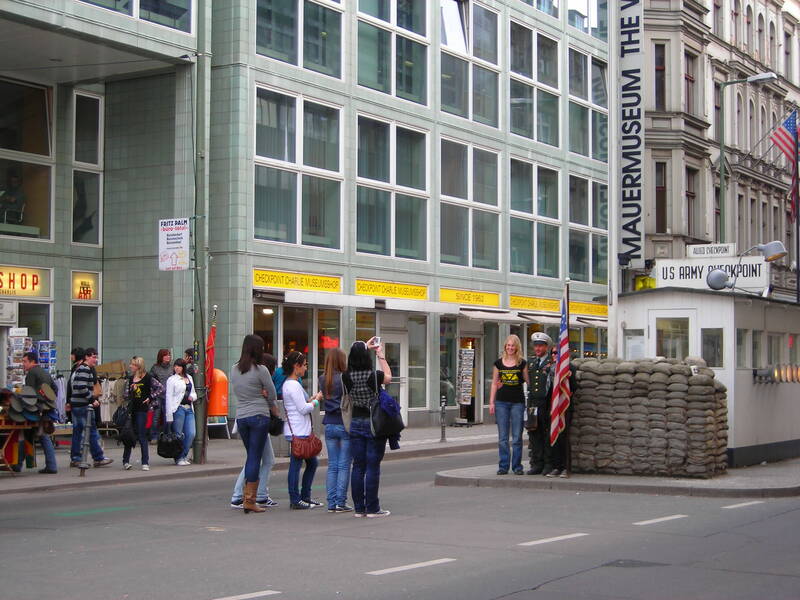 Moreover, the history of the wall has been commodified—you can buy your own wall souvenir from street vendors, take a tour of underground escape routes, or pay some guy dressed as a soldier a few euro to stamp your passport and let you take a photo with him at Checkpoint Charlie. I know another town with only one game (okay, two if you count the Red Sox). In Boston, the only history that matters is the American Revolution. Tourists flock to the Freedom Trail, they take their photos with tour guides dressed in colonial costume, and they buy tricorn hats and Tea Party tea to take home to Indianapolis or Santa Fe or Tokyo. On one hand, Berlin and Boston are lucky to have these dominant stories (as much as one can call the Wall a stroke of luck). It’s wonderful that people are interested in some history, any history. At a time when visitation to art museums dwarfs that of history museums, the Freedom Trail is the largest tourist destination in New England. But as with most things in life, it’s a double-edged sword. For starters, having only one game widens the gap between tourists and residents. Sites like Checkpoint Charlie or the Boston Massacre become mobbed with map-toting, sneaker-wearing gawkers, and locals intuitively avoid them like the plague. The one game—whether it be the Wall or the Revolution—becomes something specifically for tourists, and locals turn away to look for other stories, for history only a longtime resident would know. This gap presents a dilemma for the city’s public historians. Do you focus your efforts on the tourists—the low-hanging fruit—or do you remain loyal to your local base, even if their interests are more diverse, and therefore more challenging to address? Or do you try to do it all, and perhaps spread yourself too thin in the process? And this hyper-commodification of history—how does it affect the work of public historians? I can say from personal experience that it becomes harder to find the line between quality historical site and tourist trap, and to stay on the right side of it. Particularly when it feels like lots of photo opps and a big gift shop with sort-of-historically-accurate bright and shiny things is simply giving the public what they want. Or, that if you don’t do it, someone else will. And lastly, does the only game in town help anyone—tourists or residents—truly understand and know these cities? Berlin is a city that is healing—physically, mentally, and economically. Boston is a proud city, a city that ended up on the right side of history. But that barely scratches the surface. They both have other stories too, and other identities. It’s okay to start with the Wall, just please let’s not end there too.